Superimposing patterns on the bearing surface can be beneficial in some situations, especially under poor lubrication conditions.Studies carried out by SKF researchers, in cooperation with several leading European universities, have determined that the surface roughness of a bearing affects a range of performance parameters. This deeper understanding of the role the bearing surface characteristics play will open exciting opportunities for extending bearing life beyond the predictions of today’s theoretical limits. This greater knowledge relates to the role of surface roughness on aspects of bearing operation such as lubricant film build-up, running-in, friction and operating life. Modifying the surface structure of rolling bearings could also improve operating characteristics, particularly under poor lubrication conditions. 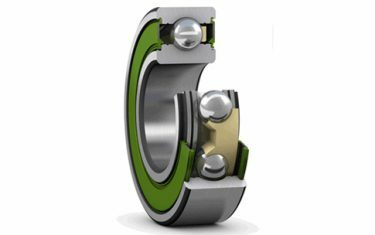 SKF has taken the first crucial steps toward this through the development of a methodology that will help it assess current bearing performance and design bearing surfaces in future products. Currently, the focus of the research has been on raceways and rolling elements. Figure 1 shows a typical surface structure. Engineers have begun to look more closely at bearing surface because, with the advances in steel manufacturing, traditional modes of failure due to fatigue are no longer the main cause of bearing failure. Instead, surface-originated failures attributed to a lack of a fully separating lubricant film caused by either very high operating temperatures, low speeds or severe starvation, in their turn trigger failure mechanisms. Previously, bearing designers and manufacturers believed that only smooth bearing surfaces were the best for long operational life. Efforts were concentrated on trying to eliminate surface flaws during production. However, researchers have long considered changing the surface topography or texture of the bearing surface as a way of reducing surface-initiated problems. Reducing surface roughness is not always an effective or cost-efficient course to take, so researchers have looked at modifying the surface by superimposing patterns over the basic surface. 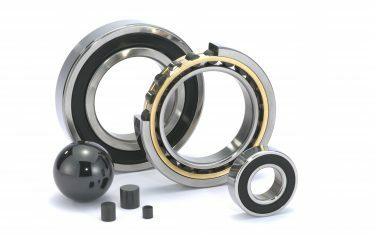 The understanding of how the roughness of a surface behaves in rolling bearing contacts is of particular importance to lubrication conditions. 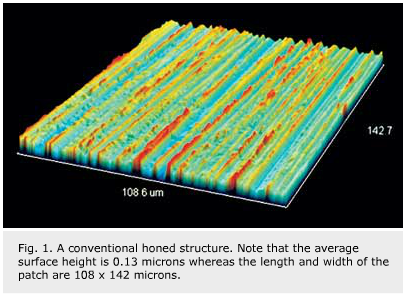 With this new methodology, SKF researchers now have the ability to tailor the roughness or microstructure (surface topography) of surfaces to specific applications so that bearing life is increased and friction is reduced. Together with the University of Twente, SKF has developed a computer simulation program called “LOPES” (Lift-off Prediction for Engineering Surfaces). The research has led to the development of analytic techniques that can allow lubricant flow to be described on a nanometer scale between two steel bodies in motion where the pressures are in the order of 20,000 to 30,000 atmospheres. It is possible to calculate how this lubricant flows between a rolling element and a raceway, around and between surface asperities. Further, it is possible to calculate how each individual asperity is deformed (Fig. 2) and to predict whether or not individual asperities on the rings and rollers may interact. Figure 3 shows typically the surface separation (lift-off) as a function of speed. Another advance, provided by the new methodology, is the ability to calculate, at the micron level, those stresses that are induced by the compression of such minute asperities – not simply at the surface but also under the surface. 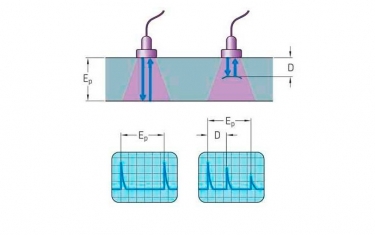 Also, it gives a calculation of the fatigue life reduction resulting from these stresses. The evaluation of the effect of surface roughness means that it is possible to determine which structures benefit long bearing life. As already mentioned, surface-originated failures are the dominant form of bearing failures. Normally such failures are caused by the lack of a fully separating lubricant film. This may result from very high operating temperatures, low speed, severe lubricant starvation or the wrong lubricant choice. Normally, three lubrication conditions are defined within a rolling bearing – boundary, mixed and elasto-hyrodynamic lubrication (EHL). In boundary lubrication conditions, almost the total load is carried by the asperities; in mixed lubrications it is a combination of the asperity and the film carrying the load. In EHL, the film alone bears the load. Conditions that determine the thickness of the film, in the case of oil lubrication, are mainly the product of lubricant viscosity and speed. If speeds are low, there is insufficient hydrodynamic action to build up a fully separating oil film, and the contact operates under mixed lubrication or boundary lubrication. The same applies for viscosity. Thick oils separate more easily to generate a thick film, and this separation effect is independent of the amount of lubricant available. Once the contact is fully flooded, providing more oil will not help to create a thicker film. The surface roughness should be designed such that it easily flattens by the lubricant flow, preventing metal-to-metal contact and giving long life. If the bearing runs under starved lubrication conditions (which is often the case with grease lubrication), the thickness of the EHL film is determined by the lubricant viscosity, speed and the amount of lubricant available at the inlet of the contact. By the design of the surface topography, more oil should be transported to the inlet of the contact and thus create a thicker film. When the lubricating film thickness becomes comparable to, or less than, the root mean square height of the random surface roughness or asperity, some metal-to-metal contact may occur. Under low lubrication conditions, such metallic contact produces local high stresses, which may result in surface distress (micro-pitting) or cause local high temperatures that lead to adhesive wear. Researchers then looked more closely at starved elasto-hyrodynamic lubrication conditions for various types of surface roughness, and the effect of surface features such as dimples, bumps, ridges and waviness on film thickness and pressure distribution. The goal was to make the best use of the available lubricant and build up the film thickness. Dimpled surface patterns were found to be the best for this purpose, but other types also function. The development of suitable surface features will depend on a range of factors, including starvation conditions, bearing type, lubricant viscosity, grease stiffness, applied load and speeds and even noise (vibrations) requirements. The outcome should be that local asperity-induced high stresses can be reduced through having a micro EHD film separating the surfaces. Previous theoretical work had concentrated on fully flooded conditions. Once starvation conditions were the focus of the work, it was found that surface features had a considerable impact on bearing performance. Work was focused on the development of a lubricating film thickness in a starved circular contact in the presence of one or more pits. A mathematical model was developed that assumed that the pitted surface entering the contact region was covered with a layer of oil of contact height above the nominal smoothed surface. This means that if the filled pits are on the moving surface, they transport more oil into the contact than a moving smooth surface would. 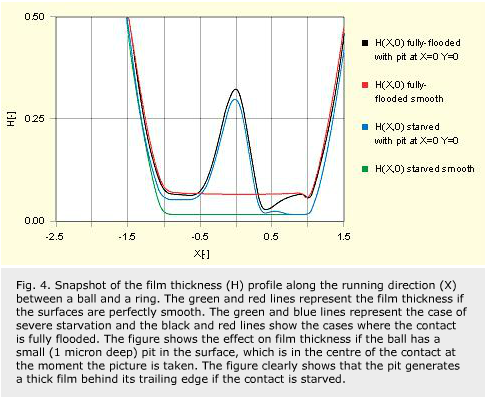 As a pit moves into a high-pressure zone, its volume is reduced by elastic deformation, providing additional oil to build up the film thickness outside the pit. Such film enhancement, which happens on the upstream side, i.e., the trailing edge of the feature, is beneficial, according to the model (Fig. 4). The film shape is dependent on the arrangement and geometry of the pits, the compressibility and rheology of the oil and the feed mechanism for the oil into the contact. However, the main influence of these surface characteristics on the thin oil film during moving contacts may be understood simply by the process of oil mass conservation combined with the movement of the oil meniscus. In essence, the pits act as additional oil reserves in poor lubricating conditions. The importance of these advances in the understanding of the role surface rough-ness plays in bearing operation and lubri-cation cannot be overestimated. Already SKF is considering the implications for existing finishing processes used in bearing manufacture, and it is supporting the evaluation of new finishing techniques. The advances also give SKF a unique opportunity to support customers with advice related to thin film lubrication conditions. The same concepts can be used in other lubricated machine elements, e. g. gears, constant velocity joints, where the SKF support can also result in longer service life. This advance is leading to new sets of design rules and the ability to develop surface roughness characteristics tailored to particular bearing applications and could change the shape of bearing design forever.